← Leaf Art by Colin Beadon – Anyone Interested? This neemakaram masquerading around as a “PROFESSOR” and has no qualifications beyond a Bachelors degree. Persaud has been introduced as Chairman of the Warwick Commission, whose report is in the Main Economics section of this week’s Economist. I recall when he was on the UN Commission of Experts with Nobel Laureate Joe Stiglitz. This one has him as a Bajan. Pity some Bajans just interested in spreading Lies rather than a bit of Love. It seems a little inappropriate and unprofessional to be implying fraud via his Facebook status update when he is stressing the importance of trust. I am on facebook and always struggling to write what I am up to in a few words, the way I read it is that he is doing two separate things, working as an expert witness in a fraud case concerning an investment management firm and also working on the refinancing of the Four Seasons resort…..but I feel a little uncomfortable speculating about the wider significance of a snippet of an informal conversation with friends. More importantly, if he is helping to refinance the 4S, I just hope he manages to do it. Would be great for Barbados and a shot in the arm for confidence at a time like now. The PM mentioned in his Ilaro Court interview that there was much work behind the scenes on the project with “young Barbadians from London”. Perhaps its him. Professor Persaud mentioned his involvement with the Four Seasons project when he was a guest on Brass Tacks about 2-3 weeks ago. Most of the details of the projects financial problems have been reported extensively in the English press, given the involvement of UK banks and creditors. Local Bajan papers picked this up once If my memory is correct) but did nothing else except report comments made by the former management about possible restart dates and that that old management had changed. 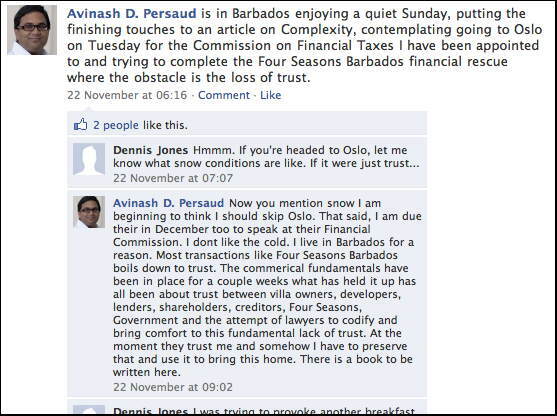 @BFP what was the significance of posting Professor Persaud’ s Facebook Pages? Prof. Persaud as far as I know is still a private citizen and I am uncertain of what public interest or news his FB postings are? @Love. Are you for real? You need some serious therapy. You are either a pathological liar or you crave attention. Either way your post is such a bore. Is Thomas Gresham, Avinash Persaud’s doppelganger? For the record, does Mr Persaud hold either a Masters or Doctorate in any field? None of the websites proffered as proof of Mr Persauds ‘s status as a economist of note (which is not disputed by me) indicate his credential level of academic attainment as holding either a Masters or a Doctorate. Gresham College is not an educational institution in the same way as say UWI. Interested persons can view its website. It appears to me to be more of a “think tank”. Notably, the Warwick Commission does not refer to him as “Professor” as it does others on the commission. Avinash Persuad is just that…..a man without letters to a Masters or Phd qualification . I do not care who he chose to pose as under this blog….to dispute what I have stated let him come to the site and declare which institution he got his Masters and Phd qualification from . His father one taught at UWI Cave Hill….I just hope he is not confusing his father’s qualifications with what he (Avinash) has not accomplished as yet…! Sing-a-song, your points are spot on. Nevertheless – How does that stop him from offering excellent financial or investment advice? So should these folk be denied their stories of success simply because they eschewed what many consider as traditional academia? PS? Uh, Bill Gates – need I say more?? Ian Bourne the way you have presented your arguments is not the issue here. The story of Bill Gates , Thomas Edison, Winston Churchhill , Richard Branson et al speak for themselves. The case about ” Professor ” Avinash is that he CLANDESTINELY allows himself to be foisted on an unsuspecting public as a PROFESSOR…to which he has yet to produce the requisite qualifications to justify such EMMINENCE ! Ian….would you wish your DENTIST and PERSONAL PHYSICIAN to attend to you on the grounds that he /she possess the requisite qualifications to render such attention to you….only to find out they are FAKES ? Such is the case with this ECONOMIC hogwash that AVINASH spews around ! A FAKE and illogical argument….without any academic substance ! That is the ISSUE with this AVINASH ! I repeat without fear of contradiction….that Avinash Persuad has no qualifications beyond a Bachelors Degree…and therefore he should NOT allow himself to be referred to as PROFESSOR. He or any other person who wishes to prove me wrong bring the evidence and Institute that he gained a Masters or Phd. qualification from. I rest my case until such time…! Well, ‘Love’ you certainly have your knickers in a stitch over Professor Persaud. You sound awfully jealous. Not to mention bitter & malicious. What is this to you? When it comes to Persuad….there is nothing to be jealous about . The man just do not have the credentials to which he lays claim. Persaud lays claim to being an Emeritus Professor of Gresham College as well as being a financial practitioner and he gets interviewed about Commissions he says he is on. Less than five minutes of research on google will show that he is what he claims. I am interested in defending a fellow economist. I recall he was one of a handful of leading monetary policy experts who spoke at the annual conference at the British Academic of Science (Economics Section) in Surrey in September. And you can check this on. And he must have been asked by Nobel Laureate, Joe Stiglitz who chaired the UN Commission to me a Commissioner – but of course Love knows more than Stiglitz. According to google, Persaud’s background was originally as a practitioner not an academic – he was a senior exec at some banks including J. P. Morgan and State Street and it seems he became academically honoured later by Gresham College, perhaps as a result of research he did as a practitioner. He seems to have penned Liquidity Black Holes Theory – before the financial crisis and he won first prize for an academic award for an essay on the failure of bank risk management etc with an interesting title of “sending the herd off the cliff edge” – its all on google. Originally starting off as a practitioner he probably didn’t have a Ph.D or a MSc. But dont look at google, because Love knows far more than the Royal Economics Society, the British Academy of Sciences, prize winning bodies, Professor Goodhart and Professor Stiglitz about the credentials of Professor Persaud. Yes of course, I buy that. Lorrrrd! Thomas Gresham…posing as AVINASH without the requisite qualifications . Try as hard as you might….this so called PROFESSOR you speak of does not possess the qualifications he claim to have. JUST DO NOT CUT IT !! Bring the evidence and Institute that this so called PROFESSOR gained his Masters & Phd from. Now it has clicked. Professor Persaud is a member of the Barbados National Council of Economic Advisors. I suspect Love is jealous of that. According to the Warwick Commission website, last Friday, Professor Persaud had his “Warwick Commission” highlighted in “The Economist”, “Wall Street Journal”, “Reuters” and he had a personal editorial in the FT, reprinted on BusinessBarbados where I saw it. I must have seen over half a dozen editorials form Professor Persaud in recent months in the Financial Times, all with the reference to Emeritus Professor. Enough to make a jilted economist or commentator feel so intensely jealous to evade the man’s facebook page and plot against him. As far as I have seen, Professor Persaud does not claim to have an MSc. or Ph.D. What I have seen is that he signs his pieces on BusinessBarbados or the FT, not as Dr. or followed by MSc, but as Emeritus Professor of Gresham College. The blurb on the Warwick Commission under his name has him as Emeritus Professor of Gresham College, not as Dr. or MSc. So we can settle this once and all, instead of everyone having to send in all their credentials to Love for him to determine whether they have the necessary credentials, Love should call up Gresham College and ask (1) do they know that Persaud refers to himself as Emeritus Professor of Gresham College and (2) is this correct? and if they answer no, Love should ask them to put something on their website informing people that Persaud is not an Emeritus Professor there, given that he is so often quoted as being an Emeritus Professor of the College. Interestingly, on the Gresham website, Persaud is listed as Professor Avinash Persaud, so they will need to correct their own website too if Love is right. He is also in a pdf file on google entitled Portraits of Gresham Professors – so they had better scrub that while they are at it. I know Gresham College and attended lectures there several years ago when I was living in London. It is a typically maverick British institution. It normally confers a Gresham Professorship on famous people who are generally already professors already and asks them to disseminate their knowledge though lectures that are free and open to the public. Sir Christopher Wren and Robert Hooke were some of the more famous Gresham Professors. Enough said. Let us leave poor Love to wallow in his jealous self-pity and home that someone considers his ideas interesting one day. But I suggest that this is not the way to go about it. @Love, I must admit to having pondered for a few days why the absence of a Masters or Doctorate has a bearing on whether or not someone is a Professor. The latter is a title and position in a university (or place of higher learning). It is obtained by competition through application. It is not a position to which one graduates via other qualifications. To make you happy, let’s call the person Mr. Persaud. He does not ‘masquarade’ around as a professor: he’s not doing much teaching. He’s a financial sector practitioner in various areas. He professes to know a lot about what he does. He actually masters the financial sector issues well, and he does not need to doctor his advice very much. For the love of me, I wonder what the fuss is and perhaps I am wishing in vain for some clarification. Funnily enough, very few PHD’s and Msc’s in economics or any discipline, predicted the last three years of economic crisis. But, as usual many are now willing to expound verily on the issue. Including a certain head of a local institution who until early last year was reported as saying that the crisis would not affect us. Remember, Msc’s and Phd’s are based on termwork and papers, but do not give anyone additional inherent ability or sense. So, everything is with a pinch of salt, even Msc & Phd’s. Having said that, I note that the economic crisis WAS however discussed on this BFP site, over three to four years ago, before the crisis hit, before it was common discussion worldwide or had even entered discussion in international papers. BFP should have the records to prove it. How many of these bloggers have Msc & Phd’s? Wrong tree, or right tree wrong branch? I’m not much of a movie buff and generally better at word play than many other aspects of literary art, and I love crossword puzzles. So, with that affliction, I have to first wonder if it is ‘Christians later’, or ‘Christian slater’, or really Christian Slater. Then the night the knight used the knife to cut to the chase, he left me his sword…or was it his word? I’m no longer in the dark, that’s clear. As astute as always, Dennis. This is one of many monikers used by this individual. Quite right, that education is not only worthy for self development for knowledge but also increased skills, necessary for the collective improvement. However, my point was really aimed at the constant harping on in respect of the Professor’s ‘qualifications’ to analyse the situation. To wit, I am answering that, in accordance with your statement, he has a right and indeed as much right to analyse the situation as any other, no one else predicted the situation anyway. I repeat that education is worthy and further education an important part of a nations development. But, there are abilities that are not gained by education i.e. inherent abilities. As for the proving, only BFP can do that, I do not have the archives, but I believe that solutions were discussed, especially pertaining to the then level of Government spending and debt levels. Is Persaud a University professor? yes or no? Dennis Jones and Thomas Gresham a.k.a Avinash Persuad…..are intentionally skirting the issue because they recognise full well that this PERSUAD is perpetuating a FRAUD. The “PROFESSORSHIP” title he masquerades around with was not achieved through any academic study…..it is akin to the Government of Barbados bestowing a Kinghthood on an individual ! Where is the proof of academic study on the part of this Avinash Persuad to be postulating the views on anything of economic note ? Let him bring the evidence to support it…..! Love a duck! Even people who have honorary titles carry credentials that make the honarary title worthy of being bestowed. So, what is your point? That Persaud knows nothing about economics and cannot advise and practise in the field? @Love, I’m not sure what the issue is that you think is being skirted. Presumably all those organizations for whom Mr. Persaud performs are satisfied. If you are one of his employers and if you believe there is a fraud our legal systems gives you some options to seek redress. Carrying titles is not usually actionable, but I’m no lawyer, so there may be some arcane statute that may give you pleasure. But on knighthoods (assuming that’s what you mean), if that were the right example, he could use the title ‘Sir’, as Sir Allen Stanford did with his Antiguan knighthood, until they stripped him of it (http://www.telegraph.co.uk/finance/financetopics/sir-allen-stanford/6489156/Allen-Stanford-stripped-of-knighthood-in-Antigua.html). Not all professorships are equal, anyway. Grief! Love – I don’t know what your problem is. Universities do have Professors who do not have Masters degrees or PhD’s – indeed there was once a Professor at the LSE who did not even have a first degree!! Emeritus Professor is a an honorary designation – usually awarded to someone who has retired or made an extraordinary contribution to his field. You should be proud of this Bajan and what he has achieved instead of trying to pull him down. Shame on you!! Love just sounds like a person with a personal axe to grind – something against the Persauds? or just plain jealosy. Why else harp on about this point of semantics. Surprisingly not mentioned so far is that Avinash Persaud was awarded second place by an eminent panel set up by Prospect, a highly reputable British publication, among 25 international people selected who made the best contribution to the nternational discussion of the financial crisis. Avinash was placed ahead of two Nobel prize winners, the head of the Federal reserve and the Governor of the Bank of England– see December issue of Prospect. He was a professor at Gresham college for a few years and was made an Emeritus professor when he left. Sad to see such blatant vindictive comments when the true information is all in the internet. Prof Persuad is in all sense a big name in Economics. If Paris hilton can get reputation of such sort that I needn’t explain who she is, by just being! Why do people have issue with a man who has actually done so much that he is honoured by universities, economists and international bodies for his contribution to human knowledge! He is a professor, he didn’t NEED to do more work to get this job, he is that good! Of course I would be jealous of the guy, if I were say in his field and finding hard to get a job.. . It is a fact that once your term is up as a Gresham Professor you have to relinqish your title of Professor. I know this as all other “professors” have done so before Persaud. And Persaud also admitted to knowing that himself when at Gresham. I may not be a globetrotting economist, but it would seem to me that “trust” is not derived from saying you are something you are not.